Great question and we’ve got an awesome answer. The answer is a bit of a secret so don’t tell anyone otherwise they will start using the few remaining spots available – then there will be none for you. These are the kind of tips embedded into the NauticEd sailing courses. The chart image below is of Admiralty Bay in Bequia, St Vincent and the Grenadines. In peak season, this gorgeous little bay gets pretty crowded. So you have to get pretty innovative about anchoring in such a tight spot. The mooring balls are almost always taken. However, looking at this there does not seem to be any spots left. But there are a few perfect spots remaining. But first, let’s cover the basics which are covered in depth (no pun intended) in the first anchoring tip linked above. Oscillation. Sailboats at anchor will oscillate from side to side under windy conditions. Some a lot more than others. The oscillations will happen under steady or varying wind conditions. 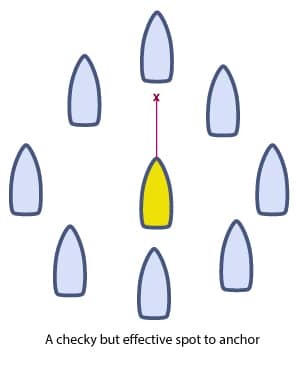 The oscillations are due to windage on the boat, the shape of the boat, and the keel configuration. Thus if you are out of sync with another boat to your side you may come together at the same time. It all means you that you can not anchor too close to the side of another boat. Differing scopes. Some skippers let out a lot of anchor rode and some not so much. This length will also depend on if they are using all chain or not. Rope anchor rode needs to have more let out than chain anchor rode. Thus a boat with rope rode will swing in a larger arc and oscillate more than a boat with chain rode. In wind, you can guess if a close by boat has rope or chain; if the rode heads straight down off the bow then it is likely chain. If it heads to the bottom at an angle, it is likely rope rode. Mooring fields. Stay away from mooring fields in windy conditions. Moored boats have a very low swing radius so if you anchor close by, you’ll likely swing into another boat. Ok so now you’re forced to anchor in an anchoring field that is bustling with boats. Where do you anchor? Remember not to tell anyone this secret. The best place to drop the hook is off the stern of another boat already at anchor. Shhhhh! The boat you dropped in behind will never oscillate or swing around into you because your swing will match theirs if the wind changes in the night. But this boat also needs to have a clear area to its aft port and starboard, so that when you back away you are clear to your sides. So other than that, this is the secret. No one else does it. You do get some surly looks from the people on the boat who you nose up to but they calm down after you start backing away. Consequently, if you are at anchor and someone comes up to your stern and drops anchor just give them a friendly wave, they probably read this article and they will be out of your conversation space in a few. But do remember that sound carries a long way across the water. Can you see where to anchor below? Click the button to find out where. You’ll notice that the spots are directly behind another boat and that there is enough clearance room either side. In these positions, you would have dropped your anchor right behind the stern of the boat in front and then backed away to allow for the appropriate scope. If you want to know all the secrets of anchoring a sailboat, take the NauticEd Anchoring a Sailboat Course, written by Alex Blackwell. Alex has tens (and tens) of thousands of miles of sailing under his keel. And to get that many, you have to stop and anchor a lot.